Mexican Saltillo tiles, coupled with decorative Talavera ceramic tile inserts. The earthy look of Saltillo tile has been around for centuries. Combined with the vivid hand-painted colors of Mexican and Talavera tile, your interior or exterior design is sure to be an attention-getter! With that, we introduce Rustico Tile & Stone. Based in Leander, Texas, they are the largest manufacturer for authentic Saltillo tile in Mexico, and a leading supplier of cement tile and Cantera stone. Without further ado, here’s Melanie with a guest post featuring a recent project Rustico took part in as the tile and stone provider for a Las Vegas eatery. 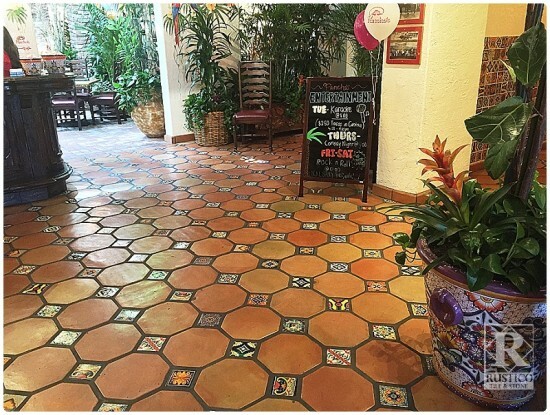 I had the pleasure of visiting Pancho’s Las Vegas recently to check out our saltillo restaurant tile and partake in good eats. Located in downtown Summerlin, Pancho’s boasts an authentic Mexican food menu that would compete with any restaurant in Mexico. For the record, I’m in the business of Mexican tile and stone. I’ve had a LOT of Mexican food, so I think my opinion should be considered. 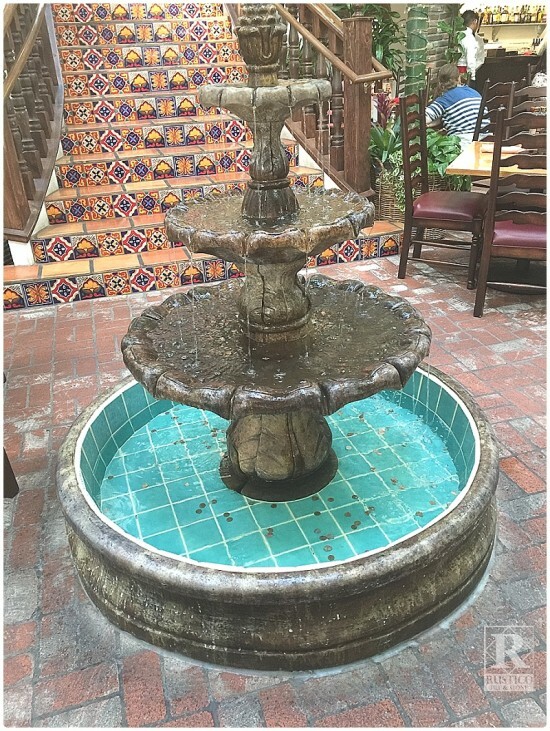 However, although I’m not a food critic, I am an expert in my field, and this article is intended to show you how beautifully saltillo restaurant tile pairs with colorful Talavera painted tiles and Cantera stone fountains. When the owner called us in mid-2015, his original inquiry was for Octagon Saltillo restaurant tile. We’ve sold saltillo restaurant tile hundreds of times. This conversation started out like a very standard phone call. As Mr. Lawrence described his vision for Pancho’s, we explored areas in which Rustico could bundle other Mexican tiles and stone. By bundling his Saltillo flooring, Talavera tiles and Cantera stone fountains, we were able to offer a value to Mr. Lawrence that couldn’t be beat by our competitors. The outcome is an eating establishment with artwork adding to every element of it’s space. Tile is art. Check out this grand staircase. A careful selection of Talavera tile designs was selected by Mr. Lawrence. He served as the designer for his space. While these are not designs that you’ll find on our website, we created these patterns and designs from the photos and emails Mr. Lawrence sent us. It’s that easy. We love working with owner/designers because they are very precise about the desired outcome. 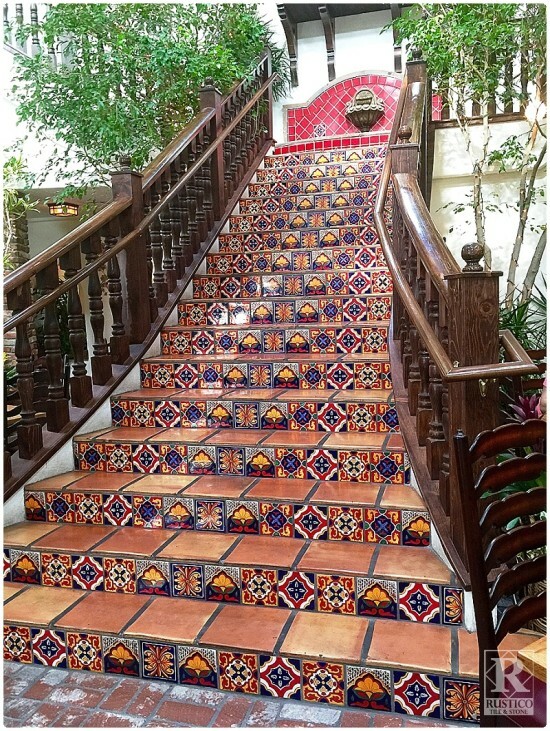 With this staircase, saltillo tile is used as stair treads while the risers are custom painted Talavera tiles. Resting at the top of the staircase is a custom, hand-carved stone fountain created from Cantera. Sitting in the middle of Pancho’s main dining room, this staircase is the focal point for the restaurant. Editor’s Note: There are so many wonderful tile designs and installations shared on Rustico’s website. Please contact Melanie if you’d like to include her as a guest blogger on your site!